Erik Fairbairn, CEO of POD Point, discusses the challenges for the UK’s charging networks, and the tipping point for EV demand. How many charging points do you have in the UK? We have shipped over 30,000 units and 2,500 of those are live on the public network. The public network is made up of a mix of Solo Units, which charge one car, Twin Units, which can charge two cars simultaneously and Rapid Chargers, which can charge a car to 80% in 30 minutes or less. What products and services do you offer for fleets? We offer the full suite of charging facilities from 3-22kw AC charge points and 50kW DC rapid charging, dependant on their charging needs. All of this is accompanied by our Management Information System which tracks usage, allows monetisation, gives the ability to create a closed network of users, shows carbon offset and tax benefit by user. Do fleets tend to prefer having their own charging points, or use public networks? It’s a mix of usage dependant on their use case. For example; return to base users would have depot charging facilities along with accounts on our Open Charge app to access the public network. Another example; fleet users that take their vehicles home would have home chargers installed along with depot access and public network accounts. Vehicle Adoption – there is an interdependency between the adoption rate of plug-in vehicles and the rollout rate of charging infrastructure; the more infrastructure, the more cars sold, which leads to increased infrastructure demand, which helps sell more cars. In the early market this cyclical relationship acts as a drag on the growth of both markets but as the market matures we will see it become a virtuous circle that leverages laws of accelerating returns. We see that we are entering this acceleration point now. Once we have a 200-mile range vehicle on the market the adoption of EV’s will increase along with infrastructure needed to facilitate. 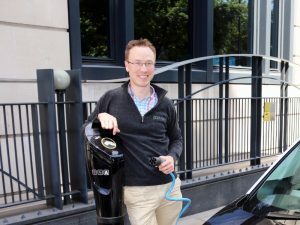 In the meantime, we are working alongside businesses like Lidl, Crown Estate, Apcoa and to start putting in place charging infrastructure to meet that demand. Vehicle Technology – OEMs use different connector types which does create some confusion for the users themselves, we have countered this by fitting all our public units with universal connectors. Perceived Carbon Cost – the general view of EVs is they are still consuming energy much like carbon vehicles. Work needs to be done to counteract that view and make people aware that networks like ours are Carbon Neutral. All of our carbon is offset using carbon programs in place. How do you see the public networks changing over the next few years? Much like mobile phone networks we believe that in time various networks will consolidate. In terms of fees, we don’t think higher usage fees will encourage adoption of vehicles and have already seen a number of our customers use ‘charging’ as an added service. In terms of location and types of charging this will be dependant on host locations and the rate of vehicle adoption. How are you future-proofing your network? We have just released a new platform for Home Charge users and Public (coming soon) where we have upgraded the connection type to WiFi enabled. This enables us to send over the air updates, support users remotely and allow them to access their charge data within the POD Point app. The Open Charge Network is setting the standard in terms of how charging networks need to operate. We did away with RFID cards and moved towards the Mobile App experience to provide a simple, fast charging experience without the need for network membership.